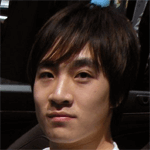 Meet Yang Zhou, a happy DAT Bootcamp customer who recently conquered the DAT. 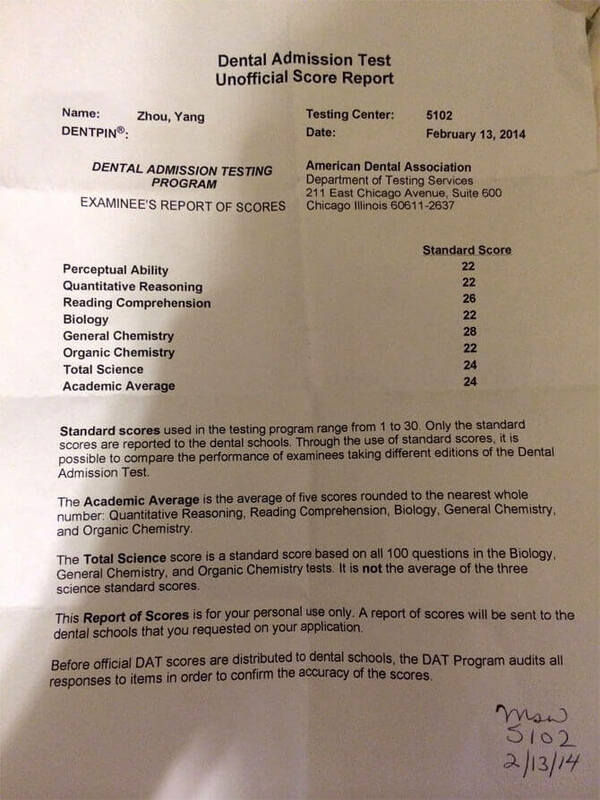 I’ve asked Yang to share his DAT experience with us as the featured student of April. One piece of advice that I would give to another students would be to give yourself plenty of time to study for the DAT. The DAT is not a difficult exam in terms of the materials covered on it. However, it is a lengthy exam that requires you to be very familiar with the contents and be able to answer questions quickly and accurately. The longer you give yourself to prepare and practice, the less frustrated you will feel. This is especially true with the PAT. Although the PAT section might seem difficult at first, it is something that can be mastered if you invest time into it and go through tons of problems. 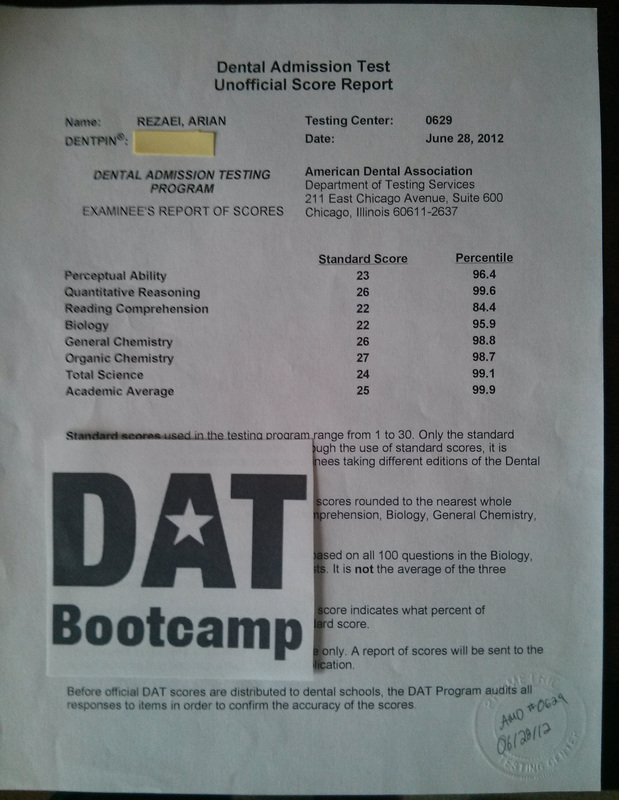 I used DAT Bootcamp after I had gone over all other materials such as Chad’s Video, Kaplan’s Bluebook, Topscore, and Cliff’s AP biology review. I used DAT Bootcamp to figure out my weaknesses so I could tackle those areas during my study to utilize my time more efficiently. I went over questions that appeared on Bootcamp repeatedly to make sure that I was familiar with all the concepts that I didn’t master. Questions from Bootcamp turned out to be very similar to the questions tested on the real DAT. I would have spent more time on the biology section as well as the RC section. The biology section probably was the most difficult to prepare for simply due to the volume of material covered. A good way to study for the RC section would be to go over your old biology textbook and Cliff’s AP biology. Afterwards, go over questions from Bootcamp and use them to figure out your weak subjects and try to relearn them. The RC section was also difficult for me to prepare because English isn’t my first language, and the section requires a fast reading speed. My advice for the RC section would be to find a method that suits you best (there are many methods to tackle the RC section mentioned on SDN) and practice. In the mean time, try to read scientific magazines as much as possible to familiarize yourself with the type of reading that is expected on the DAT. My score breakdown: 24 AA, 24 TS, 22 BIO, 28 GC, 22 OC, 26 RC, 22 QR, 22 PAT.